If you have multiple computers that can go online, you probably already have a home network set up. This is crucial to be able to do a network backup. If you only have one computer that can go on line, you might need additional equipment before you can proceed. After you have the network setup, you can either purchase a network attached hard drive like this one, or you can install a larger hard drive in a separate computer and designate that as the location for your backup. Keep in mind, any computer that you are saving your backups onto, should not contain data on itself that needs to be backed up. Trying to backup a backup makes things more complicated. As far as configuration goes, I cannot be very specific as there are too many variables to work with as every setup is different. The general idea is that you would use any of the previously posted backup methods and direct the files to the network storage that you set up. The same rule about storage space applies, make sure you have more space available on the network location then on all of the computers that you would like to backup. As you can see, setting all of this up yourself is not very easy. If you are willing to pay a bit more, there is an easier way. There is a version of Windows you may have never heard of. 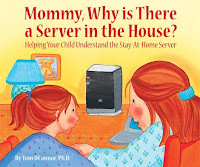 It is called Windows Home Server. Home Server is an operating system that runs on a very basic computer connected to your home network. The computer then backs up, monitors, allows for remote access and shares files with all of your other computers. Starting at $300, you can get a complete home server from HP with 640 GB of storage. Once you plug your home server in, you put the CD that comes with it in one of your computers. The disk will then walk you through setting everything up and configure the backup automatically. All you have to do is put the disk in any other computer on your network and it will configure the backup for that computer as well. This is the method that I use and it has been fantastic. The home server pools all of the data from all of your computers together so that it never has more than one copy of each file saved. This means you can get a huge number of backups saved on a single server. I just checked my Home Server and I have, 66 backups among 5 computers saved on about 600 GB. I can restore files from any of my computers as far back as three months ago. Configuration is easy and you do not have to do anything after the initial setup. Everything backs up nightly and the server manages how many and what backups are kept. If you are a bit more adventurous, you can buy Windows Home server yourself and convert an old computer to a Home Server. Keep in mind you might have to add an additional hard drive to the computer as well. I hope you have enjoyed this weeks posts on backing up. I know there is a lot to think about, so feel free to comment if you would like clarification on anything. I would also like to do more topical series in the future, so let me know if it has been helpful, or if you prefer to have a wider variety of posts. As always, thanks for reading. How worried do you have to be about viruses speading around home pc's that are attached to a server? Does the setup account for wireless nodes or do they all have to be hardwired? @JoeS Viruses have a harder time spreading across a network now that all versions of windows have decent firewalls. The home server does not make a home network anymore susceptible to viruses than your network would be prior to the server. The one requirement is that the server itself is wired to the network, but anything else can be wireless. Keep in mind the initial backup for any computer will take longer, this will be slowed down even more by a wireless connection.